In August 2015 and April 2017, salvage excavations were conducted at Horbat Bet ‘Elem (Judea and Samaria License Nos. 15-3-2015, 10-3-2017; map ref. 195112/609653) prior to the erection of electric poles and the construction of access roads to them. The excavations, on behalf of the Archaeological Staff Officer of Judea and Samaria, were directed by Y. Aharonovich and H. Cohen, with the assistance of P. Portonov (surveying), S. Ammami (photography), A. Harel (finds drawing and preparation of plans), and H. Betan (preparation of maps). Horbat Bet ‘Elem, in the the Upper Judean Shephelah and about 3 km northwest of Kafr Idhna (Fig. 1), lies on top of a low hill surrounded by tributaries of Nahal Maresha and is shaped like a horseshoe that is open to the west. 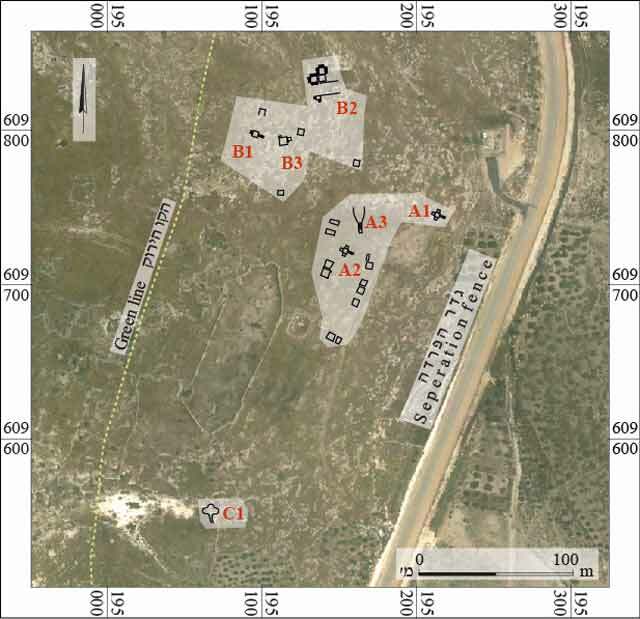 The site was surveyed several times, and its area has been estimated at 120 dunams (Dagan 2006:82*–85*). The only excavation at the site was conducted at the foot of the hill’s eastern slope during the construction of the separation fence (Batz and Sharukh 2009). In the current excavation, three areas were opened on the hill’s eastern slope, outside the built nucleus of the ruin, the part of the site formerly used for industry, agricultural activity and burial. 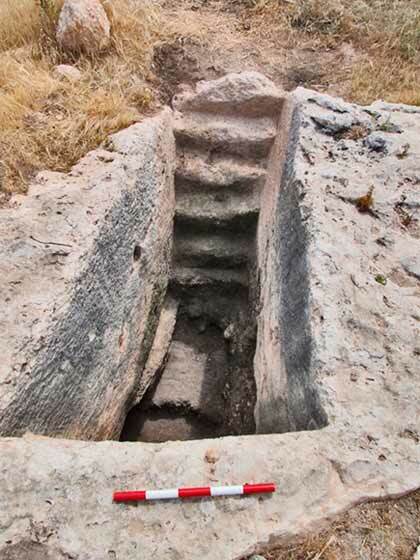 A winepress and six underground cavities hewn out for various purposes were excavated (Fig. 2). Thirteen excavation squares opened along the route of the planned access roads yielded only potsherds. The excavation recovered potsherds dating from the Early Bronze Age, Iron Age II, Hellenistic, Early and Late Roman, Byzantine, Umayyad, Abbasid, Mamluk and Ottoman periods. When the excavation was completed, the exposed remains were fenced off and partially covered over. Cave A1 (Fig. 3). A rock-cut stepped descent led to an underground chamber with three wings. The chamber wings have a vaulted, crumbling ceiling. The chamber was documented but not excavated due to technical difficulties. Based on stylistic and architectural grounds—the trefoil plan of the hall and the vaulted ceiling—the cave was quarried out in the Late Roman or Early Byzantine period. Cave A2 (Fig. 4) was fully excavated. A rock-cut stepped descent led to an underground chamber with three vaulted wings. Three distinct phases of use were discerned in the cave. In the first phase, a burial cave was hewn in a plan typical of the Late Roman or Byzantine periods (Avni, Dahari and Kloner 2008:109, Subtype 4.2.3). In the second phase, probably during the Byzantine period, the cave floor was lowered for quarrying, as indicated by straight quarrying lines at the bottom of the cave. An abundance of pottery from the Mamluk period as well as Ottoman finds indicate a third phase, during which the cave served as a refuse pit. Cave A3 (Fig. 5). A curved, rock-hewn staircase led to the cave entrance, which was wider than the other cave entrances, allowing for ventilation and lighting. Remains of a wall blocking access to the cave were exposed at the entrance. The cave had the form of a hewn tunnel (5 m long) that connected at its northern end to an ancient water cistern, which was found filled with collapsed rocks. The cave was documented but not excavated and consequently not dated. Cave B1 (Fig. 6) was also completely excavated. A stepped descent led to a rectangular burial chamber with a burial alcove opposite the entrance. A recess for a roll-stone was hewn to the left of the opening. Although the cave was found to be devoid of finds, it should be dated to the Late Roman period based on stylistic and architectural grounds. Burial Complex B2 (Figs. 7, 8) is branched. The courtyard was partially excavated and the burial chambers were only surveyed. The courtyard was large and flanked by three burial chambers arranged in two wings. A roofed entranceway in the north wing was found to have two rock-hewn, framed openings in it leading to two large burial chambers. Each chamber had 17 arched loculi that are arched in section and have a hewn frame for a closing stone slab. 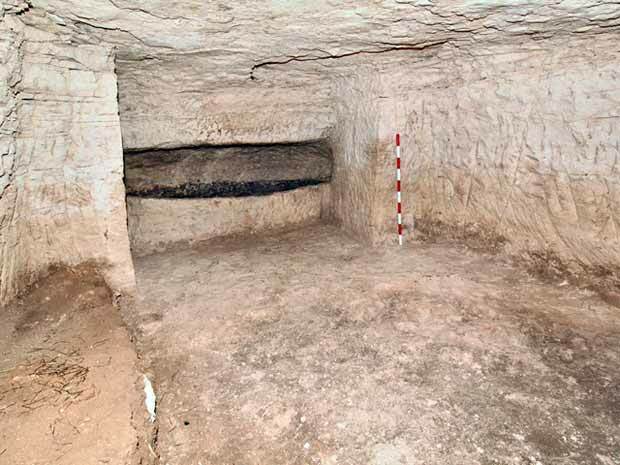 An additional burial chamber was found in the south wing. It had four more loculi with rectangular openings. Pottery vessels and ossuary fragments indicate that the complex was installed and used in the Early Roman period. Winepress B3 (Fig. 9) has a treading floor, a settling pit, and a collecting vat. All the winepress elements had a coarse white mosaic floor. A pit for anchoring a screw press was found in the center of the treading floor, and on the northern side were two small cells for storage and other uses. Winepresses of this type with a screw press are characteristic of the Byzantine period. Cave C1 (Fig. 10). A rock-hewn stepped descent led to an underground chamber with three wings, each with a vaulted ceiling. Prior to the excavation, two rows of triangular columbarium niches were discerned. A probe opened opposite the entrance in the central wing exposed two additional rows of niches. The cave floor was not uncovered due to technical difficulties. The alluvial fill that excavated in the cave yielded Mamluk potsherds. At least two phases of use were detected in the cave. In the first phase the cave was probably used for burial; its plan is characteristic of the Late Roman or Byzantine period (Avni, Dahari and Kloner 2008:109, Subtype 4.2.3). In the second phase, the cave floor was lowered, creating bell-shaped chambers, and the cave was converted into a columbarium. No diagnostic finds were discovered in the cave. 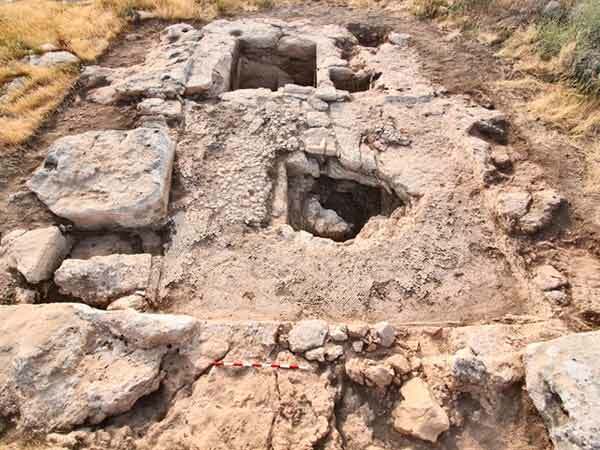 However, based on stratigraphic grounds and parallels with rock-hewn bell-shaped caves in the Shephelah containing columbaria with triangular niches in their walls (Zissu and Kloner 2014), the second phase probably dates from the Byzantine or Umayyad period. The excavation identified and exposed a variety of underground cavities. Burial Complex B2 attests to a settlement that existed in the Early Roman period, which had not been previously identified at the site. The elimination of the burials in Caves A2, C1, and probably in Cave A1 as well, indicates a change in population composition during the Byzantine period. The systematic transformation of these spaces into underground quarries points to public construction at the site during the Byzantine period. 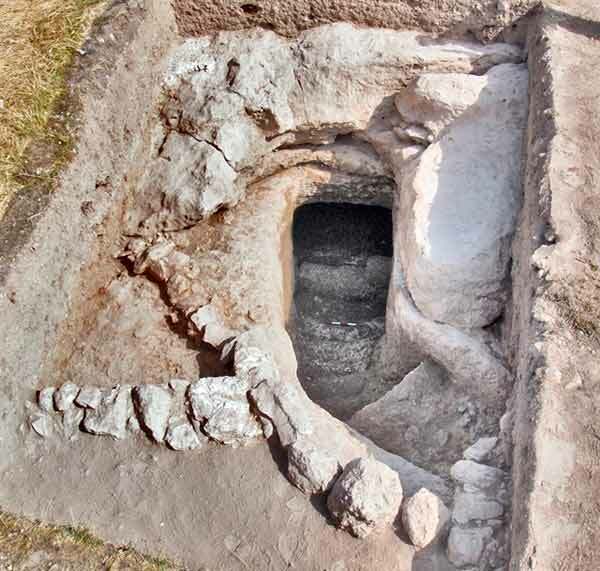 Finds from the Umayyad and Abbasid periods were discovered on the surface and in the alluvium fill excavated in several trial squares, making it impossible to determine the nature of the activity conducted in the eastern part of the site during these periods. 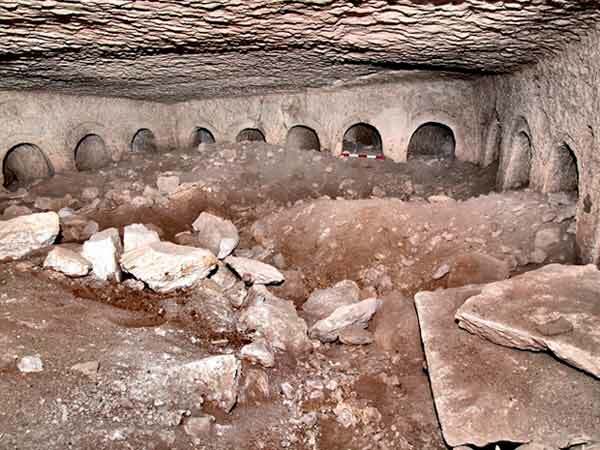 During the Mamluk and Ottoman periods, debris accumulated in some of the underground cavities, evident in the clusters of pottery, as in the case of Cave A2. Batz S. and Sharukh I. 2009. 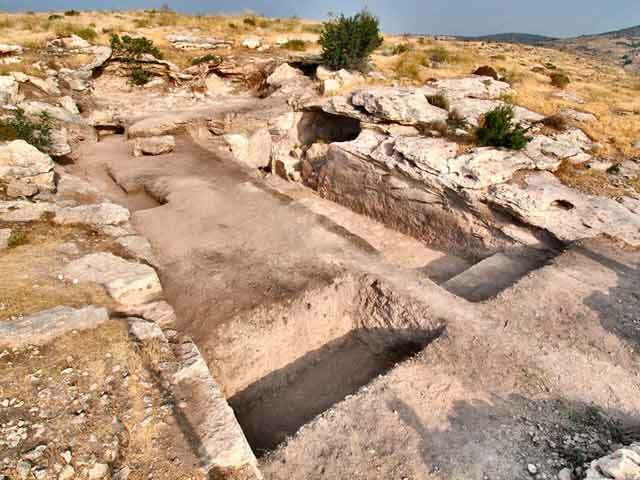 A Byzantine-Period Winepress and Quarry at Khirbet Beit ‘Alam. In I. Yezerski ed. 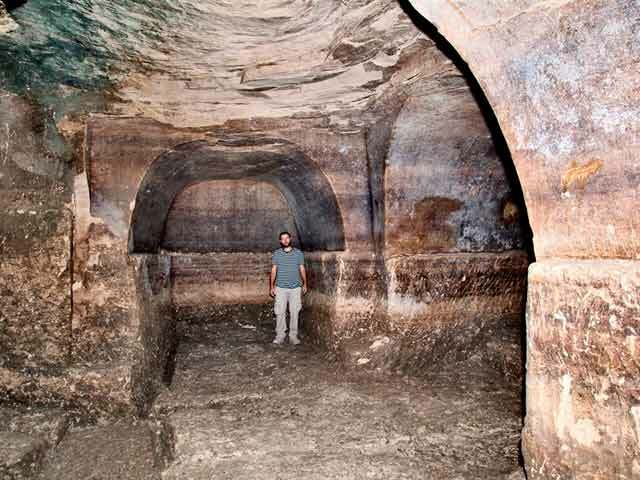 Excavations and Discoveries in Benjamin and Judea (JSP 10).Jerusalem. Pp. 279–280 (Hebrew; English summary, pp. 35*). Dagan Y. 2006. 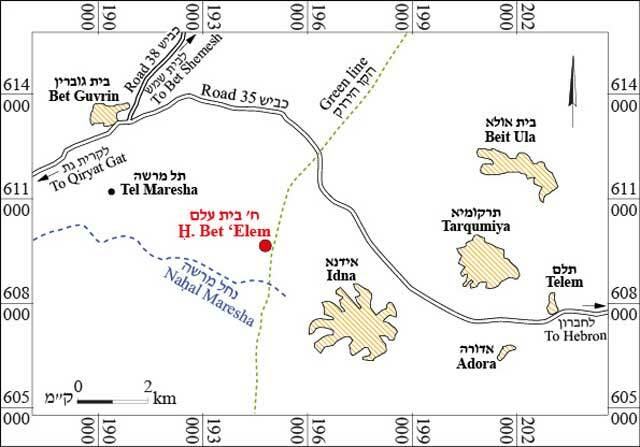 Map of Amazya (109) 1: The Northern Sector (Archaeological Survey of Israel). Jerusalem. Avni G., Dahari U. and Kloner A. 2008. 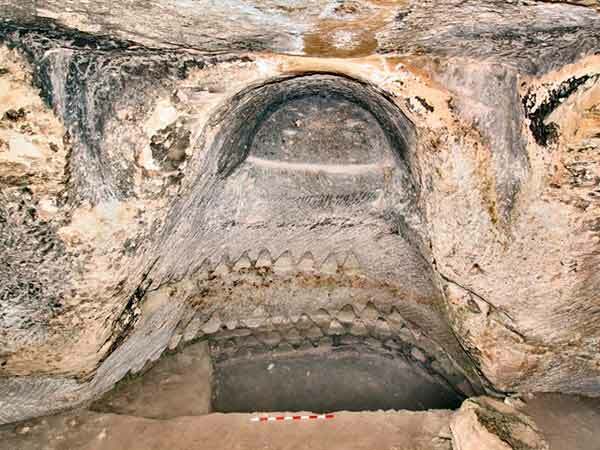 The Necropolis of Bet Guvrin–Eleutheropolis (IAA Reports 36). Jerusalem. Zissu B. and Kloner A. 2014. The Bell-Shaped Quarries of the Judean foothills, Israel. Opera Ipogea 16/2:47–60. 2. Map of the excavation areas. 3. Cave A1, stepped descent into the cave, looking east. 4. Cave A2, the south wing (to left of opening), looking south. 5. Cave A3, descent to cave entrance, looking northwest. 6. Cave B1, looking northwest. 7. Burial complex B2, courtyard of complex, looking northwest. 8. Burial complex B2, west burial chamber in north wing, looking southwest. 9. Winepress B3, looking east. 10. Cave C1, north wing (opposite entrance), looking north.